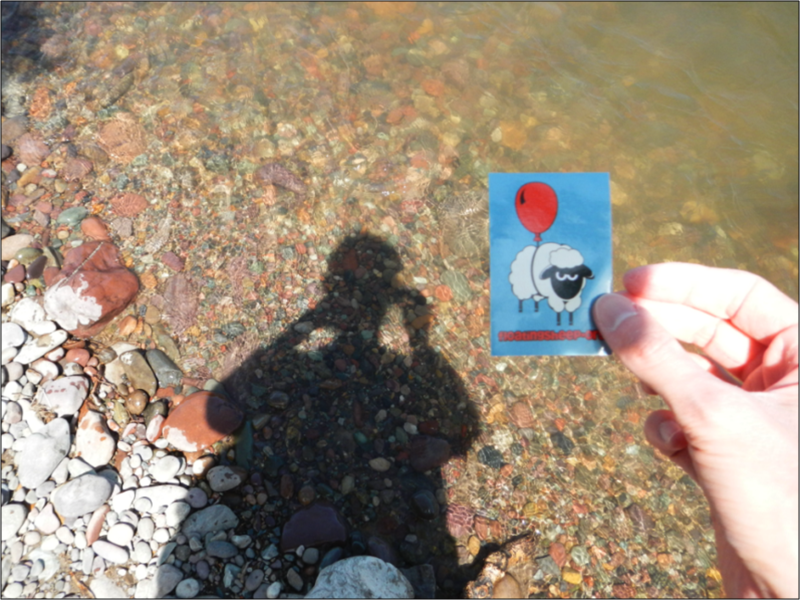 The epilogue to the photo essay documenting the adventures of the FloatingSheep (sticker) in Missoula, MT courtesy of Chris Van Dyke. Of the following photo, the author notes, "I have to give credit for this idea to the FloatingSheep, who thought the juxtaposition of my shadow, his existence, and the river made for an artistic statement that was only slightly preposterous. Indeed, notice that the FloatingSheep has no discernible shadow – an ontological paradox or a deeper statement about the liminal and spectral quality of the lives we lead." Fieldwork must really get boring....be sure to catch the entire presentation below. We started thinking about zombies again recently (OK, we never really stopped) when a Kickstarter project by David Hunter proposed to introduce zombie based learning (ZBL) into middle school Geography curriculum. At first David seemed just like our kind of guy, after all he says "I love geography, and I love zombies". Cool. However, we did take issue with his assertion that "I’ve chosen to combine geography and zombies because I don’t think it is a natural connection." We, sir, beg to differ. To us, the connection seems very obvious and very natural. After all, knowing where the zombies are is really the most fundamental question we should be asking. OK, fake outrage aside, we wanted to throw our support behind this project (and perhaps drive some donors to it) but before we got around to finishing this post, the ZBL project was fully funded. So if money was no longer an issue (Ha! After this is a public school teacher) we thought we'd offer up some instructional material for the ZBL project. As you are now figuring out, this is really a long way of revisiting our obsession research interest in zombies and geography. We realized that we had failed in our mission to educate if someone like David could still think that there was an ontological distinction between geography and zombies. Clearly we had to better articulate the epistemological framework by which we select the construct and actants through which Geography is studied . Preparing for the Zombie Apocalypse, Part I: Zombies or Old People? Preparing for the Zombie Apocalypse, Part II: Brains or Salads? Always a good way to get out a difficult argument, especially if you aren't making much sense. 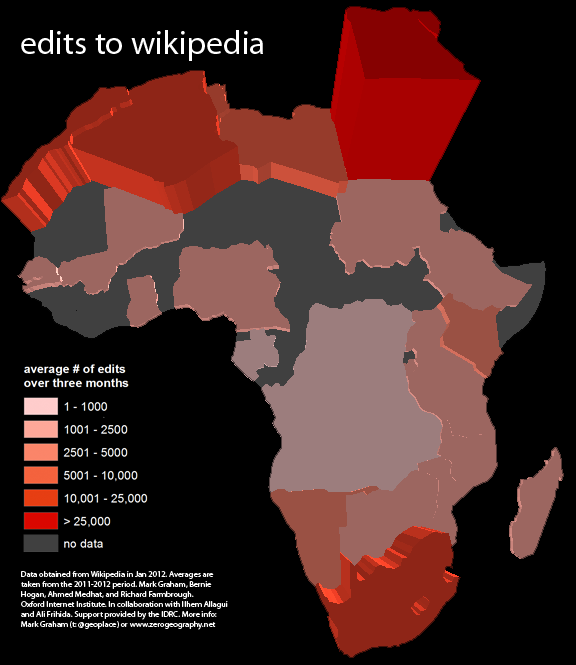 Time for a few more maps from our database of Wikipedia edits (which tells us how many contributions to the encyclopedia originate in each country). 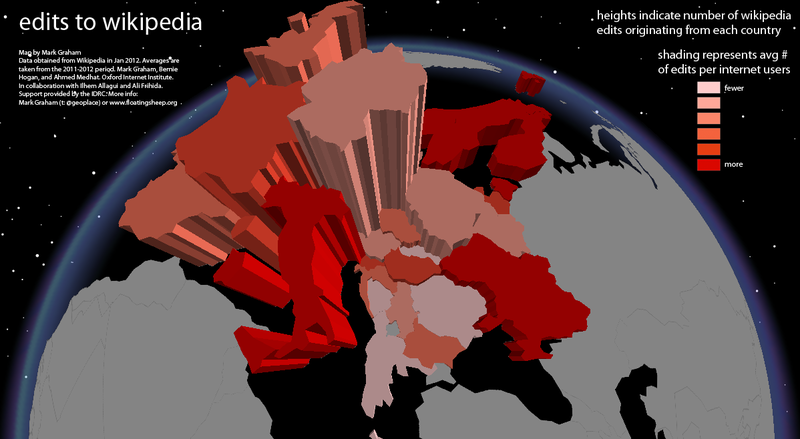 In the maps of Europe below, the height of each country represents the number of edits originating in that place. The shading indicated the number of edits per Internet user (darker reds meaning higher per capita participation). We see that the majority of edits in Europe come from Germany, the UK, France and Italy. 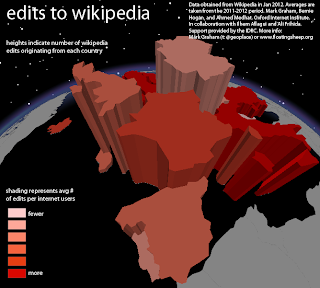 Other countries in Europe contribute far less to Wikipedia. Interestingly though, Germany and UK have fairly low participation rates when normalised by Internet population. 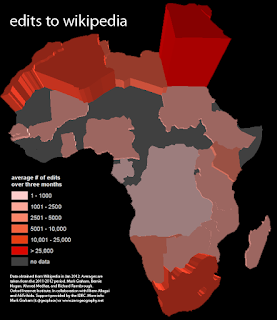 Internet users in Italy, Scandinavia, the Baltic States, and even Ukraine are more likely to make an edit to Wikipedia than their British or German counterparts. Also notable are the relatively low (total and relative) participation rates from Portugal and Poland. Mark is hiring a part-time Research Assistant to carry out research into the geography and social structure of Wikipedia in the Middle East and North Africa through large-scale data analysis. The position will involve the analysis of the corpus of Wikipedia text, user-pages and history files and the use of statistical techniques to explain spatial and social patterns. Our research question focuses on patterns of representation on Wikipedia as well as an articulation of patterns of conflict and barriers to participation. The successful candidate will manage and perform queries on a large database, statistically and geographically analyse and visualise results, explore alternate methods to answer the project's core research questions, and assist in writing academic papers and technical reports. • Ability to work autonomously and be creative in the ways that you answer research questions. • Experience working with publicly available secondary datasets. The deadline for applications is June 1. Please get in touch with Mark if you have any questions.